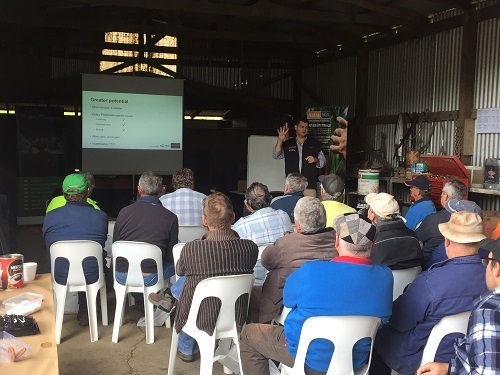 Practical guidance on improving nitrogen uptake in cane and reducing losses have been the focus of Incitec Pivot Fertilisers’ agronomy meetings for cane growers this season. Rob Dwyer, Tropical Systems Agronomist with Incitec Pivot Fertilisers, has been meeting with growers in Northern New South Wales, the Mackay/Whitsunday region, the Wet Tropics, Herbert and the Burdekin over the past couple of months to discuss holistic nitrogen management. Rob Dwyer, Tropical Systems Agronomist with Incitec Pivot Fertilisers, provided practical guidance to hundreds of cane growers on getting the most out of nitrogen ahead of this season. “Usually at these seasonal meetings we focus on the value of protecting nitrogen with ENTEC®, how it works and how it can be used to good effect in cane,” he said. At the meetings, Mr Dwyer likened nitrogen losses to air escaping from an inflated rubber glove, with a finger each representing volatilisation, denitrification, leaching or runoff. “The ultimate goal for growers is to keep applied nitrogen available for crop uptake and that’s represented by the palm of the hand,” he said. “If you’ve got a rubber glove full of air and you notice air escaping from one finger, you can block it off, but that air just gets pushed into the other fingers. He said ENTEC stabilises fertiliser nitrogen in the ammonium form for around six to eight weeks, so that large pools of nitrate nitrogen are not sitting in the topsoil at risk of losses through leaching and denitrification. Retaining nitrogen in the ammonium form also helps reduce the potential for runoff losses. In heavy rainfall events, Mr Dwyer explained how nitrate nitrogen, a very mobile nutrient, could leak out of the sides of beds with water movement into the inter-row and off the block. Ammonium is more tightly held in the soil and less prone to this kind of “lateral leaching”. “That’s three out of four losses covered, but is that really good enough?” he asked. In considering runoff further, Mr Dwyer said one of the best ways to reduce runoff losses was to ensure adequate incorporation of the fertiliser. “If the slot made by the double disc opener or stool-splitter is left open, the fertiliser can move straight up and over the top of the soil during rainfall or irrigation events,” he said. “Especially with any kind of serious downpour, the rain will be channelled to the base of the plant, so runoff is likely if the fertiliser is left exposed to the rain in an open slot. Mr Dwyer said cane growers should aim for 10 cm of compacted soil cover over their fertiliser. He quoted research by John Hughes from the Queensland Department of Agriculture and Fisheries in the Sandy Creek area south of Mackay, which showed that dissolved inorganic nitrogen (DIN) losses from runoff could be reduced by nearly half (46%) by using a ‘Stool Zippa’ closing wheel to achieve compacted soil cover over the fertiliser band. 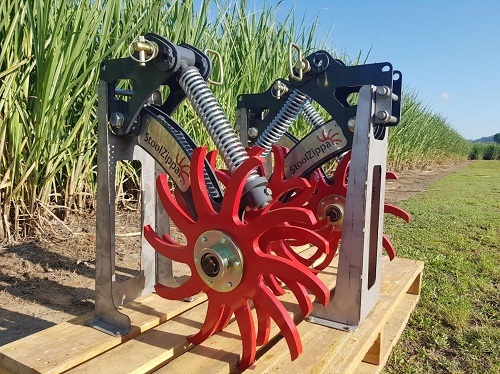 “These finger press wheels do the job really well, especially over variable conditions like differing soil types, soil moisture, trash levels and crop heights,” Mr Dwyer said. Adequate fertiliser incorporation is also his key recommendation for reducing volatilisation losses. He said nitrogen losses from volatilisation could occur even with buried fertiliser when the fertiliser was still visibly open to the air or had a sparse and patchy soil covering. Product selection also plays a role. “Unstable ammonia gas is more likely to form when using urea, DAP or Muriate of Potash in the fertiliser blend, because they create an alkaline reaction locally in the soil,” he said. “Having 10 cm of compacted soil cover is critical, because it gives enough of a buffer to that reaction that the ammonia doesn’t break out into the air. At Incitec Pivot Fertilisers’ seasonal cane meetings this season, growers were encouraged to adopt finger press wheels to ensure compacted soil cover over their fertiliser bands. Mr Dwyer said another option for reducing volatilisation losses for growers unable to consistently achieve 10 cm compacted soil cover was to use GranAm® fertiliser as a nitrogen source. “The acidic reaction GranAm produces locally around the fertiliser band gives it a natural protection against volatilisation, whether the fertiliser is applied in a slot or on the surface of the soil,” he said. By applying this advice, Mr Dwyer said growers could cover all four nitrogen loss pathways and protect against runoff in two ways, giving them confidence that they’ve done the best they can to manage nitrogen for the season ahead. If you have any questions about ENTEC or nitrogen management in cane, please contact Rob Dwyer on 0428 111 471 or rob.dwyer@incitecpivot.com.au.